When we last left off with the Apollo 18 viral, it looked like the final preparations for the Apollo 18 mission were in place, and now it seems we have the interesting results of the voyage. 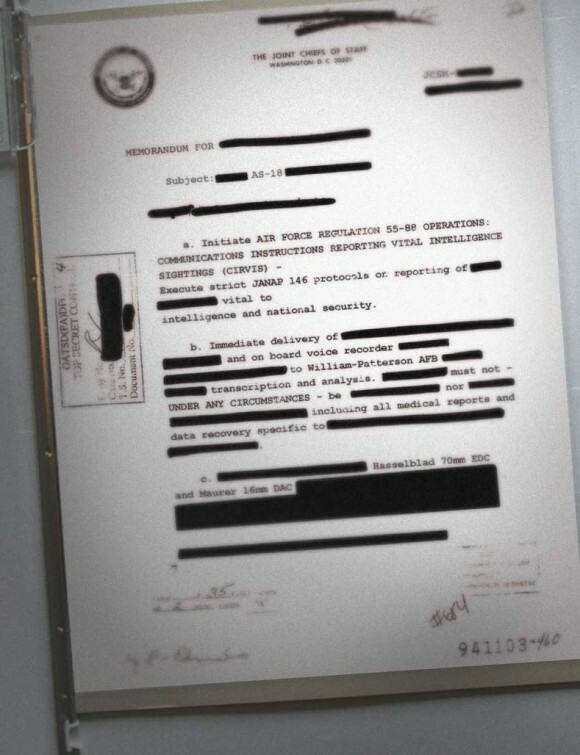 Check out the new document image from Cerberus Station 9 after the break. In this letter to the Joint Chiefs of Staff, procedures for sightings of intelligent life are being put into place, which means everything from the mission is getting analyzed, and everything is Top Secret. Air Force Regulation 55-88 (CIRVIS) under JANAP 146 is in place, which is a real thing that you can read about here. The document talks about sending evidence (including most likely the camera and footage that becomes the film) to William-Patterson Air Force Base, but there is no such place as far as I could tell. There’s a Wright-Patterson AFB in Ohio, so they could have meant that. Interestingly, that particular base has played a role in the viral campaign for Super 8, as well being mentioned in the original teaser trailer. The password to open the document, titled “as18”, is “surveillance”, as found by MovieWeb. For more information on the film and its viral campaign, check out our Apollo 18 Viral Page.